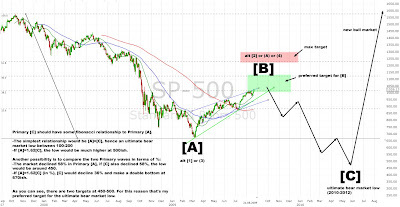 Technical Analysis and Elliott Wave Theory: Will the top occur in September? The entire last week the market was bouncing in a narrow range between 1020 and 1040. This whole action looks like when the top for Intermediate wave (W) was formed. Then, the market spent two weeks between 930 and 950 till it finally broke down. So, I think we'll see another quite boring week without any big move. A first indication that we'll be looking at the very first waves of the next Primary wave would be a breach of 1016, the low of wave [iv]. A break below the low of Minor B would very likely confirm it. 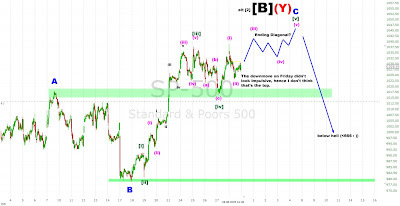 Alternative count: currently in wave [ii] or at the beginning of [iii] of C; the target in this case would lie at 1120ish. The big picture: The long term count remains the same as shown in my last weekend update. Primary [B] (alt ) should conclude between 1014 and 1120 followed by Primary [C] (alt ) to 450-500 somewhen next year.